What And Where is Cyrodiil? Cyrodiil is a large area which dominates central Tamriel and in Elder Scrolls Online it is the setting of the Alliance War which is where all of the PVP (Player Vs Player) action takes place. PVP in ESO can be complex and is a little different from other games. This guide has a bunch on information about PVP, how to get into Cyrodiil, the mechanics at work in Cyrodiil, campaigns, siege weapons, keeps and more. Cyrodiil is that large space right in the center of Tamriel. In Cyrodiil you can participate in the Alliance War. This means that players from opposing Alliances can attack you and you can attack them. Players of the same Alliance are allies and can’t fight each other. You can take keeps, fight for control of the Elder Scrolls and crown an Emperor for you Alliance. You can’t simply walk to Cyrodiil though, even though it borders a zone from each Alliance. You have to join a campaign first and then travel to Cyrodiil. A campaign is like a separate instance, or separate server / shard, of Cyrodiil. Each campaign looks exactly the same and consists of the same land and keeps. Campaigns are a way of splitting the population of Tamriel up into different servers to reduce lag and increase performance. Campaigns also allow for different rules – like the non-Vet campaign which only allows players who have not yet reached Veteran Rank 1 to join. To access any of the campaigns press ‘L’ or open the Alliance War screen from the top menu. You can press on the “Campaigns” tab at the top to take a look at all of the current campaigns and show the population of each campaign. You can set both a home and guest campaign for each of your characters. A home campaign is where you should spend most of your time. A home campaign lets you travel to Cyrodiil via a wayshrine and you will be able to participate in the leaderboards and attempt to become Emperor. A guest campaign lets you travel into another campaign but you won’t be able to be ranked in the leaderboards or become Emperor. Joining a guest campaign can be useful when your home campaign is full or you want to join some friends and they are in another campaign. Once you have set a home and a guest campaign you can click on a campaign that you have chosen and select Travel To Cyrodill to join in. Sometimes there might be a queue as the campaign is full. When you enter Cyrodiil below VR1 you will notice an increase to all of your primary stats like Health, Magicka and Stamina. This is because you are Battle Leveled. This system is designed to increase the stats of players to about VR15 level to even the playing field for PVP. An actual VR15 player will always be better off due to gear, passives and Skill Points. Battle Level scaling increases Max Health, Magicka Stamina, Health Regen, Magicka Regen, Stamina Regen, Armor, Spell Resistance, Spell Damage and Weapon Damage. Battle Level does not increase Critical Strike Rating. It is wise to consider turning off Battle Level (Settings>Game Play>Battle Level) when you reach levels 45-50 as it is possible that Battle Level is actually reducing some of your stats. It varies depending on your particular situation with gear and passives, etc. Once you are in a campaign and have traveled to Cyrodiil you can begin! If it is your first time you will have the option to complete a short tutorial which is recommended for new players. This tutorial will teach you the basics of keeps, sieges, siege weapons and scrolls. If you missed it or skipped it all of that information is available right here. Arriving in Cyrodiil will place you at one of the two entrances of your Alliance. Your Alliance has two entrances which hold wayshrines, shops, siege merchants, banks and other helpful NPCs. These areas are safe and players from opposing Alliances can’t attack you here. The main method of transportation in Cyrodiil isn’t wayshrines it is the transitus network. This network connects the keeps that your Alliance has captured and lets you teleport to them. If a keep is under attack, or is cut off by an enemy keep you can’t teleport to it and will have to get there manually. You can see your transitus lines on the map. Part of tactics in Cyrodiil involves cutting off enemy transitus lines and then cutting off the reinforcements travelling over the land to the battle. Participating in PVP in Cyrodiil by taking keeps, attacking enemies and healing allies earns you Alliance Points. Alliance Points are basically the currency used in Cyrodiil. You can spend Alliance Points on siege weapons and at the various merchants located at your Alliance entrances. You can even buy things like glyphs, weapons and armor from merchants in Cyrodiil using Alliance Points. As you fight in Cyrodiil you will level up your PVP Rank which also levels your Alliance War Skill Lines which can provide you with some nifty skills to use in PVP. There are 50 PVP Ranks and each couple of levels grants you a new title. You will also gain a Skill Point for each PVP Rank. Siege equipment includes all of the weapons and equipment which is useful in a siege – things like ballista, boiling oil, rams, trebuchet and catapults. You can purchase siege weapons from a Siege Merchant located at each entrance for your Alliance and also in each of your captured keeps, resources and outposts. Jump to Siege Equipment for more detail on all of the siege weapons and equipment available. Keeps are probably the most important or most common aspect of fighting in Cyrodiil. Scattered around the place are large forts and castles which can be captured by each of the three Alliances. Keeps all have an outer wall and an inner fort. They all follow a similar layout however the terrain and some specifics vary from keep to keep. Captured keeps allow the transitus shrines to work and this allows easy and quick movement around the battlefield. Resources are the three mills that surround each keep. There is the Lumber Mill, the Farm and the Mine. If your Alliance owns a keep thoses resources will level up over time and provide bonuses to the defense of the keep. The Lumber Mill gives the doors of your keep more strength. The Farm gives the NPC guards of your keep more Health. The Mine gives all of the walls of your keep more strength to take more hits. Resources are important and if your keep loses all of its resources to an enemy this will cut off transitus transportation. Your Alliance can try to take an enemy keep at any time. To take a keep and convert it to your Alliance enough allies must first break the outer wall, then the inner wall and then finally take each of the two flags inside the keep itself. Allies standing on the flags will all help to take that flag and convert it to your Alliance. This might sound simple but it can be a long and complex process. It is often wise to take at least one resource of the keep before attacking as this will give you an area to fall back to if things get tough. You can use the support of friendly NPCs at that resource to defend your allies when you do have to fall back. Taking a resource may alert the enemy of your presence, however, and might result in quick reinforcements of defenders. The outer wall is strong and large. Siege weapons will be required to break it down. Stone Trebuchets and Ballistae are the best at damaging a keep wall. If your Alliance gathers enough players to operate the siege weapons the wall can come down in a couple of minutes. Defenders of the keep will, of course, try to destroy your siege weapons and kill your allies. They might also use siege weapons like Fire Ballistae and Boiling Oil to defend the hole in their wall. Your Alliance might decide that it has enough players to directly attack the front door. This is not a good idea with few players as guards are constantly watching the front door. With a lot of players, however, you can use Rams to quickly bash down the front doors. This might result in a quicker entrance with enough players. Once the wall is down your Alliance can pour in and start to take down the inner wall. There are NPCs inside the keep wall and these are Veteran Rank 12 so they can be a pain. Enemy players are even worse and they can be sneaking about ready to attack your allies on siege weapons. The inner wall is similar to the outer wall and will eventually fall if enough siege weapons are operating and you are not killed by the guards or by defenders. There is also a front door which can be opened with Rams however this is defended pretty well and enemy players can rain down Boiling Oil on to your allies while they are trying to break open the door. Once the inner wall is down your Alliance must storm the keep and take the two flags inside. Flags will convert to your Alliance if enough allies all stand on the flag at the same time and remain alive for about 20 seconds while the flag changes. There are two flags inside the keep. The flags will be heavily guarded by NPCs and players and due to the close quarters things can get confusing! There are archers and mages on the top level, up some stairs on either side of the flags, and these will fire damaging arrows and fireballs while you are trying to take the flags. It might take your Alliance only 10 minutes to take a lightly defended keep with enough players. It might also take several hours of painstaking work to take a fully defended keep. Your Alliance might also be “wiped” which means that all of your allies were slain and it is likely that the enemies defending the keep will launch a counter attack towards your own Alliances closest keep. Outposts are small forts located between two keeps which can be captured by an Alliance. There are only three outposts – Sejanus, Nikel and Bleakers – and these are near the centre of Cyrodiil and separate the home keeps of each Alliance. Outposts are much easier to capture compared to keeps as they only have one wall to break through and one flag to capture inside. Outposts are defended by several NPC guards and often enemy players as well. 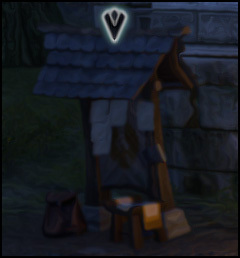 You can travel to an outpost using the transitus network as long as the outpost in connected to a friendly keep. You can NOT use the transitus network once you arrive at an outpost. Travelling to an outpost is a one way trip with the transitus network. Siege weapons and equipment plays a large role in many battles in Cyrodiil. Taking and defending keeps and scrolls is vital to your Alliance’s performance in PVP and using siege equipment is very important to both of these tasks. Below is a list of all the siege equipment available and the damage that each item deals. The damage of siege weapons has just been updated and this list reflects that. There is also a little description of each item and the best uses for each item taking into account damage, reload time and efficiency. Damage To Walls: 4000 Very good for attacking walls. This siege weapon has the best range and the most damage to walls however it also takes a long time to reload. Damage to Walls: 3500 Good for attacking walls altough not as much damage to walls as a Stone Trebuchet. Very good damage to players however a long reload time. Damage to Walls: 3000 Ok for attacking walls but not as much damage compared to the other Trebuchets. Good damage to players and also reduces movement speed. Damage To Walls: 2000 Good damage to walls which is not as high as a Trebuchet but makes up for that with faster reloading. This is probably the best weapon to use to take down a wall. Damage To Walls: 1000 Good damage to players with a damage over time componant. Not as good as the normal Ballista for damaging walls. Damage To Walls: 500 Low range and low damage however the area hit with this siege weapon is very large. Damage To Walls: 500 Low range and low damage however this siege weapon reduces enemies healing received by 50% which works really well with other damaging siege weapons like Fire Ballistae and Fire Trebuchets. Damage To Walls: 500 Low ranage and low damage but great at reducing enemy movement speed. The movement speed reduction cannot be removed from enemies and this works great with other damaging siege weapons or controlling a breach in the wall. Damage To Walls: None The Ram can be useful for taking down a door but will not work for walls. This is only useful when your Alliance has enough players to kill the guards near the front door. Damage To Walls: None Great for defending a keep, outpost or wall as this deals a good amount of damage over time to a large area. The oil must fall before it is armed so you must place it on a wall and pour it on enemmies. This works best when many Flaming Oil pots are set up to damage the same area and can repel large forces. In this example the AD (Yellow) has taken the keep outside the EP (Red) gate. This forces the gate open and access to the scroll temple is permitted. The AD in this image has taken the scroll and now the EP is fighting back and attacking the keep. 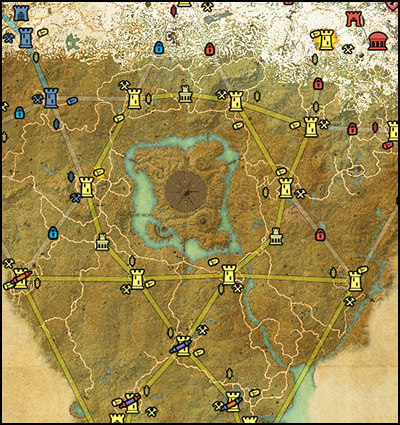 If your Alliance captures all of the six inner keeps which surround the Imperial City in the centre of Cyrodiil then the player in your Alliance with most Alliance Points at the time will be crowned Emperor. If your Alliance has an Emperor then you and your allies will all gain a significant Health bonus. Being crowned Emperor is a significant achievement and will unlock a title and a dye color plus a new Skill Line. When a player is Emperor they will gain many bonuses to their stats which will make them very powerful compared to other players. It is possible to kill an Emperor, however, and this awards an achievement. An Emperor will remain crowned until all six inner keeps have been lost. The now ex-Emperor will lose most of the bonuses but will retain a couple of small bonuses from the Emperor Skill Line. Being crowned as Emperor is a difficult task which is out of reach for most players. To be at the top of the leaderboards takes a lot of time and maintaining that position requires significant play time. 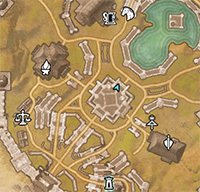 The Imperial City is located in the centre of Cyrodiil and is another place in which you can PVP. You will need to buy the Imperial City DLC to access this content. To read up about Imperial City visit the Imperial City page. I noticed your guide did not mention the wide area of effect Oil Cats have. Not only do they cause burn, they have a wider area of effect. Both Meat Bags and Oil Cats have heated content and are huge deterrents. Often times in battle a Fire Ballista shots right past or over the enemies you are trying to hit. Also many players like myself, carry enough Fire Resistance that we can and do take direct Fire Ballista shots and keep going or heal through. For some of us Lightning or Meat Bags are a more effective deterrent. There damage may be less on impact but because we are not as immune make a better choice in some cases. Are loading times (aka recast) different for Cat vs. Treb vs. Ballista? With the damage range for the Catapult so much less than the Trebuchets, I’d guess the loading times have to be a little faster on the lighter damage Catapults to make them worth the effort. If not, then there wouldn’t seem to be any reason to buy the Catapults. Or is it just a cost thing? Trebs have the slowest reload time. You can effectively run 3 Trebs firing them all within the time of the others recharging. Ballistas have the second fastest firing recharge rate but also second farthest firing range. Catapults fire the fastest but have shortest range. 1 Catapult is effectively ran by 1 person 2 Ballistas can effectively be ran by 1 person. Trebs have the highest height range and farthest range out of all three. Ice Trebs are great for enemy players due to lack of resistance and slowing effects. Lightning Ballistas are best for enemies due to lack of resistance and snaring effects. Fire Ballistas are most effecting used with rams on doors and also NPCs taking resources. I don’t have alot of exp with Catapults however Meat Bag Catas prevent players from healing or be healed. Battering Rams deal no damage to walls. They start moving with 3 people move and attack fastest with 6. They automatically move to the front door. They cannot stack on door. Only 1 active Ram can be used on the door however if you break down the outer door and find heavy resistance at the inner doors they can repair their outer door. If this happens you can have 2 Rams up at the same time (one on outer door one on inner door) a Ram will break a door down in roughly the same time as 4 Stone Trebs. It’s useful to use Rams in a keep past enemy lines to avoid heavy sieging. 1 Ram and 2 Fire Balistas are best to use with a 9 man group. 6 at door with Ram 2 on Fire Balistas firing on door and 1 person watching for enemy troops with the Balistas. Door repair needs less kits then the wall does and repairs faster, also cheaper in long run. Taking an inner door works best to get to second flag the fastest. Perk of using Ram technique are of following. Using 1 Ram only shows 1 active siege on a keep. Which does not seem like a huge siege compared to 9 Stone Trebs on the wall. So your less likely to have a huge enemy force come to defend the keep. How do you form a group? If you have a active ram weapon, you can ram through a door easyly. Just ask if someone ordered something from the military. Excellent guide – any chance of getting it updated please?